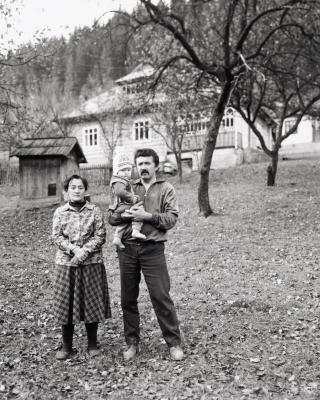 Lida Suchy's parents where born in Ukraine and immigrated to the United States during World War II. Like many citizens of the former Soviet Union who chose to escape political and religious persecution, or to pursue the dream of opportunity in the West, they were fully aware that as exiles they may never again be allowed to freely visit their homeland. After the collapse of the Soviet Union in 1991, Suchy accompanied her 84 year old father back to the place of his birth in Ukraine. Although the house he was born and raised in was found in ruins, they continued to search for places from his childhood memories. Traveling in the Carpathian Mountains they met Vasyl Potjak from the nearby village of Kryvorivnya, who welcomed them into his home. The following year Suchy returned to Kryvorivnya to live with the Potjak family, and spent the next year photographing the People of the Village Kryvorivnya. The photographs she made during that period serve as a portrait of this community, and a personal exploration of the artist's own identity as an American of Ukrainian descent. Under the control of the Soviet Communist party, cultures which predated the Russian Revolution by hundreds of years found their national and religious identities suppressed and reshaped by the Soviet Union into one unified communist state. The villagers of Kryvorivnya are Hutsuls, an ethnic group of pastoral highlanders, who are highly regarded for their art and folk traditions by other Ukrainians. Under the Soviet Union ancient customs and religious ceremonies were forbidden, even the act of speaking in Ukraine instead of Russian was illegal. In the photograph of Vasylyna Dmytrivna and Vasyl Mykolajovych Zelenchuk made on their wedding day, we see the vital re-birth of the traditions which had been previously practiced in secret. Originating from separate gatherings in their families' homes, the bride and groom in traditional dress meet on the street, and are greeted by villagers en route to their church ceremony. Despite the difficuties of living under Soviet rule, the Hutsuls remained steadfast to their indigenous traditions, a trait which distinguishes them among Ukrainian people. The Soviet Union's agrarian and industrial based economy collectivized all available resources, land and property were taken away from their original owners and controlled by the state. In rural villages, farmers moved from a state of self-sufficiency to a dependency on a state controlled bureaucracy. In Kryvorivnya after the collapse of the Soviet Union, the villagers lobbied local politicians to have their lands returned to families of the original owners. This allowed the villagers to once again return to a point were they could begin to support themselves by their own means. The camera was not a part of everyday life in Kryvorivnya, but the villagers took the act of being photographed by Suchy« very seriously. Often being photographed at work in the field, they wanted to present themselves in a formal manner for their portrait. The photograph of the village mayor Kateryna Dmytrivna Leniv in her office personifies this seriousness and utilitarian sensibility, both in her expression and attire. Lida Suchy's photographs of the People of the Village Kryvorivnya reveal a community whose cultural identity had been forcibly removed, and remained hidden, but never lost. Kryvorivnya is a story of the survival of cultural identity through the reclamation of tradition. Lida Suchy lives in Rochester, NY and participated in our Artist-In-Residence program in November 1994. There is no question more quintessentially American than “Where do I come from?” Family origins are complex to pursue and inevitably the answers are unexpected and difficult to accept. The fruit of a transplanted tree never tastes the same. For those forced to leave their own countries under duress, maintaining a clear answer to that question is vital. Lida Such´y was born in the United States into a family of Ukrainian refugees who escaped the storms of political persecution that Stalin’s Soviet regime brought to their country. She was raised in a strong Ukrainian American community that sought to protect and pass on their culture and language. Lida eventually grew skeptical of the idyllic stories of a faraway land and a people that she would have belonged to if not for the exile. Likewise, she saw members of her own ethnic community in the United States clinging to a myth that was not allowing their culture to take root in its new soil. In 1992, following the collapse of the Iron Curtain, Such´y accompanied her father on his first return to his homeland in over fifty years. He was deeply disappointed to find how severely his town at the base of the Carpathian Mountains had changed. The home he grew up in was now being used as a chicken coop, while his family’s graves were neglected and covered with roots. Turning to the mountains where Lida’s father spent his summers, they met Vasyl Potjak in the village of Kryvorivnya. Potjak welcomed them into his home and invited them to return. Determined to confront the myths of her youth with the realities of Kryvorivnya, Lida returned a year later to photograph the village and its people. Watching her approach with her large format camera gear, one woman exclaimed, “You look like you are from Mars.” Yet when Lida spoke the village language with a distinctly older dialect the woman immediately recognized Lida as one of her own. What Lida discovered was that Kryvorivnya was also struggling to reconcile its own history and tradition with its present and future. Careful to represent this complexity, each portrait adds another dimension to our understanding of these people, from the traditional mountain farmers and clergy to the more progressive officials and businessmen. What gives Lida’s portraits their unique perspective is that she stands simultaneously inside and outside the community she is photographing. They are at once intimate and solitary portraits, not simply a search for identity, but a genuine attempt to connect. The search for her roots led Lida to her own backyard. After her initial trip to Ukraine, she began photographing Ukrainian Americans in Upstate New York, where she currently resides. Surprisingly, this also became a process of discovery as her earlier frustrations were replaced by a new understanding of her community. In these portraits we recognize the family resemblance of distant relatives whose traditions have diverged. Although her culture had changed, it was no less authentic then the Ukrainian culture from Kryvorivnya which had changed and is still changing. While photographing in Kryvorivnya, Lida used her smaller 35mm camera as a kind of sketchbook. With these 35mm stills, her husband, Misˇo Such´y, a photographer and filmmaker, created a film about Kryvorivnya titled Pictograph. In a more direct way, the film also moves between myth and reality as drawings of traditional village life are contrasted with contemporary photographs. We see axes replaced by chainsaws, horses by motorcycles, and hear poetic folklore followed by songs of Soviet imprisonment. Like Chris Marker’s La Jetee, a film also composed entirely of still images, Pictograph reveals how clearly our journeys into the past inform our present reality. Looking to the West from Ukraine, like her portrait of Vasyl Potjak looking through his binoculars, Lida saw how far apart the two cultures had grown. Ukrainian Photographs is a portrait of two people who share a culture, a language, and a past, but who now look forward to very different futures. Like Lida, we are left to resolve the myths and realities of these two portraits, and ultimately, find a place to stand between them. Lida Such´y lives in Syracuse, NY and has won numerous awards, such as the Rice Foreign Residence Fellowship from Yale University, which enabled her to travel and work in Central and Eastern Europe. Brian Tuglio lives in Dublin, Ireland where he is a lecturer at the National Film School. The Light Work Grants in Photography program is part of Light Work’s ongoing effort to provide support and encouragement specifically to Central New York artists working in photography. Established in 1975, it is one of the longest-running photography fellowship programs in the country. Each recipient receives a $3,000 award, an exhibition at Light Work, and publication in Contact Sheet: The Light Work Annual. This year’s judges were Kalia Brooks (former Exhibitions Director, Museum of Contemporary Africa Diasporan Arts, and Adjunct Professor, Tisch School of the Arts at New York University), Elizabeth Cheng Krist (former Senior Photo Editor, National Geographic), and Sarah Stolfa (Executive Director, Philadelphia Photo Art Center). The recipients of the 42nd Annual Light Work Grants in Photography are Robert Knight, Lida Suchy, and Marion Wilson. The work of all three photographers evidences a deep commitment to long-term study. Sensitivity to time and a focus on duration guide the work of these photographers. In Robert Knight’s series, In God’s House, the photographer studies the entanglement of architecture, space, and religion. Docu­menting sites of worship, usually during service or prayer, Knight shows how the occupants of a space determine its meaning and understanding, oftentimes different than its origi­nal design and intent. As demographics shift, the new occupants repurpose the use of these religious spaces, as in the instance of a Euro-American Baptist church that has thrived by welcoming refugees from Burma. Or they may accommodate another faith, as an Episcopal church’s conversion to a Buddhist temple, or an historic Catholic church’s conversion to a mosque. The long exposure time in Knight’s photographs creates motion in his images that is both cinematic and ghostly. We can trace the outlines of worshippers praying in Jummah Prayer, Grand Mosque, Rome, Italy, but the blur implies a spirit leaving or entering the space and mingling with its worshipers. Even the photographs with only a few worshipers share this quality: in Sunday Mass, Saint-Germain-des-Pres, Paris, France, there is a haunting absence in the cerulean light that creeps along the walls. Lida Suchy is a former Light Work Artist-in- Residence and 2016 Guggenheim Fellow. Her Portrait of a Village: the People of Kryvorivnya, Ukraine documents the warping and passage of time in the small West Ukrainian village in the region her family was forced to leave during Stalin’s regime. After the fall of the Iron Curtain, Suchy returns to the land of her family, fifty years after her parents’ escape, to photograph the 2,000 villagers and forge a long-term project that has now spanned two decades. Suchy photographs with an 8 × 10 inch view camera. Her labor is apparent: the patience and quietude of her portraiture convey genuine connection and collaboration with her subjects. In one such photograph, two children posing with their horse in the polonyna (pasture) face forward, greeting the camera with familiarity and comfort. This image seems to have a rightward slant, but the child atop the horse sits centered and upright, almost straightening the composition. In another photograph, taken last summer, Suchy captures the local Kryvorivnya priest, Father Ivan, and two pilgrims who have come to a forest site in the Chorno Hora Mountains where they believe the Virgin Mary has appeared. Though they do not engage with her camera, we can sense Suchy’s presence is welcome as she takes in this intimate and deeply spiritual scene. Photographing moss, the first plant form, Marion Wilson celebrates deeper ways of seeing that look to more respectful engagement with the greater environment. Formerly a painter, she applies gel to mylar; the ghost of this image is visible beneath her large- format, translucent photographic prints of an organism so small it survives only on dew. Interested in botany’s scientific and metaphorical attributes alike, Wilson studied for over a year with bryophyte expert Dr. Robin Wall Kimmerer. But her durational efforts expand beyond the gallery and outside the lab. She started MossLab/The Mobile Field Station—a renovated RV—and drove it from Syracuse, NY, to Miami, FL, col­lecting moss specimens and setting up “first looking encounters” along the way. Wilson invites viewers to pay attention to the over-looked timelessness and omnipresence of moss in a project that parallels her social practice of working with marginalized neighborhoods and populations. A place of democratized looking, the viewing space and lab become one. The projects of Robert Knight, Lida Suchy, and Marion Wilson all span a great deal of time. Each presents an enduring and committed effort to observation and connection, displaying how communities—and in Wilson’s case, life forms—grow and develop.